Bright college years : inside the American campus today · One Book. One Author. One Hour. Notes on front endpapers: P. 178 Pay-highest, Cornell-male surgeon 1,779,730. Small college $53,000 full prof., state school 65,000. Adjunct $1,000 a course. National college workload 29 hours v. 60s hours in 1960 p. 103. 2 p.m. Mon. 2002-60% of college students p, 254. 800,000 college and university instructors. I started teaching at 22 p. 195 (Stories about students) * an undergraduate education p 205. Private schools--28,000 per 28 weeks study p. 109. $1000 per week, $83 per class. World's campuses--700 degrees. GI Bill p 127. On campus 1900 232,000, 1940 1.4, 1946 2.4, 1960 3.2, 1970 7.5 million. Where do the excerpts throughout the book come from? Head camera--p. 76. Why so much drinking Anglos v. Blacks v. Hispanics International students p. 83. What is night campus syndrome p. 100. [Verso] Average credit card debt $2000, average income $4000. Campers generate 2.5 B in products a year with logos. New ideas for future College p 235. Alex Sauder, Vartan Gregorian, Neil Rudenstein. Notes on front fly sheet: College of Charleston, Judge Al Sanders. College presidents--average life 3.6 years p 206. Too expensive--too big costs 1. tenure; 2. Physical plant. Parents-Ozzie and Harriet--p 218. U.S. College education endowment--$100 Billion. 60% in hands of top 50 schools. Alumni giving $3 B a year. National Alumni Forum--run by Lynn Cheney. U. of Phoenix--p 239--first viable for profit school. Underlinings/Notes: Underlinings: Author's background, recruitment of students, business of education, budgets, graduation rates, details on college life. Notes: "60 colleges," "New York's college fair," "25% 25 and older," "2.5 million workers," "1 million bachelor degrees," "1 in 2 Americans to college," "29% require remedial," "55% women, 80% public institutions," "26 Billion in loans," "$17,000 a year per student," "2,125 4 year schools," "Foreign students," "3 tribes," "55 minute lectures," "U. of Wisconsin," "Freshmen 82% white," "26% interested in politics all-time low," "rich," "brother hung himself," "best years of my life," "76 students, OSU 58,000. " "29 tribal colleges," "Berea, Yale, Queen's, Rutgers, Notre Dame, Brandeis, Brigham Y.," "only 80 all-female," "16,000 tribal students," "Columbia," "85% of undergraduates live off campus after 1st year," "food on campus 7.1 Billion," "email," "100,000 messages a day," "MIT grad student Head camera," "Binge drinking," "no heroes," "Sexually transmitted disease," "85% of college women sexually active," "student crime survey," "70% of students do fine,""athletes," "Fraternities bingers," "3 million male undergraduates, 400,000 Frat.," "students are damaged goods," "1905 18 men died on football fields,""night campus syndrome/workloads," "NSF buys a powerbook for every student," "nose rings=total normal." "28,000-28 weeks, $1000 per week, $83 per class," "create an American college," "world's campus 800 degrees," "30 professional assoc. in D.C.," "ed=50 states," "Proust, Tarzan, Confederate Constitution," "fraternities," "1st known use of 'campus' Princeton," "Academia Plato 390 BC," "Latin," "Harvard 1638," "William and Mary," "Elihu Yale," "Nicholas Brown," "1862 Land Grant," "Ezra Cornell," "Oberlin, blacks and women,""1924 1 million students," "YMCA 1 in 7 to 1 in 30," "GI Bill," "campuses double, triple," "mega-schools," "SAT," "reading," "most teaching in U.S. Colleges," "Yale is different," "the reception," "grad schools," "all faculty think in 7," "U. of Wis. Doctor diagnosed his own death," "5 of 305 tenured math profs are women," "two career couples," "more than one maternity leaves," "Chicago meeting of MLA,""26,000 members of MLA," "1970-20% study arts, 1995 8% do," "Ad," "Put caps and watch who stays," "Downsize your expectations," "adjunct," "tenure track faculty," "highest paid professor," "adjuncts," "adjunct 40 to 50% face to face teaching," "students teach," "make faculty teach 5 courses a semester," "5 year contracts," "Sherry Young 5 children," "MacArthur awards,""University Presses," "Academic books,""no more than 3 ideas a lecture," "the flu," "Student comments on Prof.," "1968 philosophy of life," "visually liberal, aurally conservative," "an undergraduate education," "an undergraduate education," "Sports are important," "U. of Illinois 1,349 in one class," "S.C," "dorm rules," "Saunders on parents," "Ozzie and Harriet," "This is politics," "Harvard endowed chair 2 million," "ad-free campus," "Coke," "myths," "How can Higher ed. survive?" "Administration 27 cents to 45," "3 year Bachelors," "U. of Phoenix, 60,000 degrees," "Geo. Mason," "Dor[o]thy and the Confederate flag," "Princeton reunion," "Princeton's endowment 4 Billion," "Men and women give money differently," "nationally 20% tenure for women," "fund raising--going in for the kill," "'70 reunion," "P-rade," "Dante," "graduation." 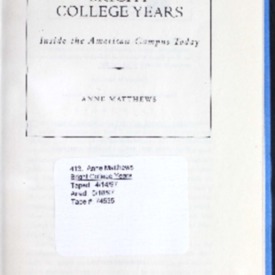 Matthews, Anne, “Bright college years : inside the American campus today,” One Book. One Author. One Hour., accessed April 19, 2019, http://booknotes.gmu.edu/items/show/373. Tracking and mapping the academic year, Matthews casts a searchlight in turn on those who learn, those who teach, and those who arrange, especially the makers and managers of money and image whose methods shape higher education more strongly every year. In the process, she goes behind the scenes at every type of school: enormous state universities like Texas or Arizona, where finding French class requires a map and a bus ticket; sleek country-club schools like Vanderbilt or USC, where student allowances can exceed faculty salaries; fiercely specialized colleges like Cal Tech, where students dream in computer languages; struggling trailer-house campuses like South Dakota's Sinte Gleska, the nation's first Native American university.Throughout, Matthews keeps in unsparing focus the conflicts between our competing images of what college is supposed to be: show business, rite of passage, profit machine, private planet, gateway to knowledge and power. Irreverent, engrossing, vastly entertaining, and intensely observed, Bright College Years is one veteran journalist's (and native daughter's) inside scoop on a beloved American institution in the grip of enormous change.On one level, the world of higher education is still, as Matthews puts it, "a chunk of the twentieth century dropped live and squabbling on the threshold of the twenty-first." But behind the stately trees and lovely towers a powerful hidden life has taken root, as academe is buffeted by the same economic and demographic forces that are drastically reshaping the rest of society. What's going on in there? And while we're at it, what exactly, these days, is college for? "Universities and colleges--United States--Case studies."